I recently moved to a small town, but I had high hopes for the public library because there are two colleges nearby. I had not yet compiled my Steampunk book list, so I went in mostly in search of classic science fiction to get me started on exploring the genre from its roots. 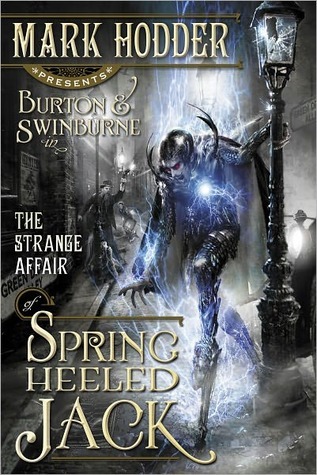 But, as I combed the shelves Mark Hodder‘s The Strange Affair of Spring Heeled Jack jumped out at me. I had never heard of the author or Spring Heeled Jack, but calling it a “strange affair,” plus the font on the spine told me I was probably looking at the right time period. I have never realized how much a font could draw me in before and I am so glad I pulled it off the shelf! The first thing I did before I started to read was look up Spring Heeled Jack. There is a long article about the whole history of sightings here, but basically he was a figure that popped in and out of the public eye during much of the 19th century and into the 20th. He was spotted all over England and eventually made his way to the United States as well. What Mark Hodder does is take all of the historical facts, including names and dates, and builds a new narrative to bring the whole saga together. In addition to Jack, Hodder also co-opts several of the “Great Victorians” as heroes and villains. The protagonists are Sir Richard Francis Burton and Algernon Charles Swinburne. I was familiar with Burton and his involvement in the debate over the true source of the Nile, but my knowledge ended there. Swinburne was a Victoria-era poet with a taste for the bottle and the teachings of the Marquis de Sade. They seem an unlikely duo but they make an excellent team in this action-packed mystery. The year is 1861, but the world is filled with things that should not yet have come to pass. Flying armchairs (called rotochairs) help the populace get around and the postal system is composed of foul-mouthed parakeets that have been genetically designed to deliver messages. Queen Victoria was a but a brief blip on the historical radar because she was assassinated only 3 years after becoming queen, leaving the Libertines (who debate whether murder is the ultimate act of individual expression) and Technologists (whose experiments with genetics are way beyond the pale) to vie for social power. Burton has just finished a night of heavy drinking with some pals and is accosted by a strange man with blue flames framing a devilish face with glowing red eyes. The apparition gives Burton a savage beating all the while warning him to leave the red-eyed man alone. The encounter starts Burton on an adventure that will challenge his mind, body and very sense of self. I would absolutely recommend this book to anyone who enjoys Steampunk stories. I will definitely be using examples from this novel to help explain the genre to others because there are several re-imagined technologies and “punked” figures from history making appearances. The writing style is engaging and the plot was compelling, so I was very happy to find out there are more books starring this daring duo. You can find a full list with descriptions here. Next on my reading list: Morlock Night by K. W. Jeter. This entry was posted on December 17, 2013 by Phoebe Darqueling. It was filed under Books, Graphic Novels and Adaptations and was tagged with Algernon Charles Swinburne, Burton, Mark Hodder, Richard Francis Burton, Sir Richard Francis Burton, Spring Heeled Jack, steam punk, Steampunk, steampunk blog, Strange Affair of Spring Heeled Jack. Aha. So you have. Another good review. Loved the book. Was very descriptive, but was a good descriptive, where it wasn’t way too much. Thought the story was fantastic.